Hidden Hills Log Cabins is a newly built and completely furnished luxury cabin with fully equipped kitchen, gas fireplace, two full baths, two bedrooms, with queen size beds, central heat and air, satellite TV/VCR/DVD, hot tub, fire ring, and gas grill secluded on 16 acres, with pond, located in the scenic Hocking Hills. A newly built and completely furnished luxury cabin with fully equipped kitchen, gas fireplace, two full baths, two bedrooms. 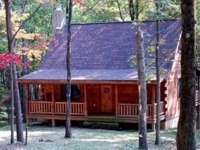 Satellite TV/VCR/DVD, hot tub, fire ring, gas grill, secluded, with pond.